Washington – According to Belarusian news agency Belta, the World Bank and Belarus have agreed on a $125 million draft loan for a new energy-effectiveness project. The United States chargé d’affaires in Belarus Jonathan Moore commented on the situation with U.S. sanctions against Lukashenka’s regime. The Jamestown Foundation: Will Lukashenka Be Welcomed in Prague? 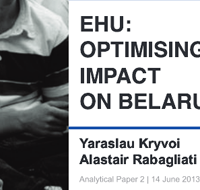 WASHINGTON – David Marples has written on the most recent developments in EU-Belarus relations in the Jamestown Foundation’s Eurasia Daily Monitor.